Thursday, February 16 was World Read Aloud Day. I love to celebrate World Read Aloud Day because I feel that reading aloud is SO IMPORTANT at ALL grade levels/ages. I am in an elementary school and I’m certain all of my teachers read aloud to students in their classroom. HOWEVER, I think as kids get into upper elementary grades, classroom teachers start reading aloud more from novels instead of picture books. That’s AWESOME because some students understand more when they listen to books than when they read on their own, BUT I feel like it gives our students the impression that reading picture books is not important or for them (they think they are “too old” and picture books are for “little kids.” Granted, many times this is coming from parents…) SO, World Read Aloud Day gives me the chance to share great picture books with others and to pull folks in who may not typically be a part of a student’s read aloud life. Over the years, I have asked local celebrities to read (news anchors, local government officials, etc. ), but this year I kept it very simple and pretty much left it as an “in school” sort of thing. My guest readers were folks like our Literacy Coach, my intern, and my library other half (I am part time and kids who see me don’t typically see her, so it was like a real “guest”). I also encouraged teachers to pair up – so, maybe a 3rd grade class read to a Kindergarten class or a 1st grade class read with a 4th grade class. It was wonderful seeing students read together. I kicked off the day by reading a book over our live morning news show feed. To schedule the read alouds, I sent out a Google Doc about a week prior that teachers used to sign themselves up during times I posted. The day before, I pulled a big stack of books that I know are great read alouds. We had readers all day and it was simple and wonderful! Some students and readers brought their own books to share, others used mine. What a great way to celebrate and very easy to do for other reading events, as well! I can totally see this working for Read Across America, Global Read Aloud, etc.! 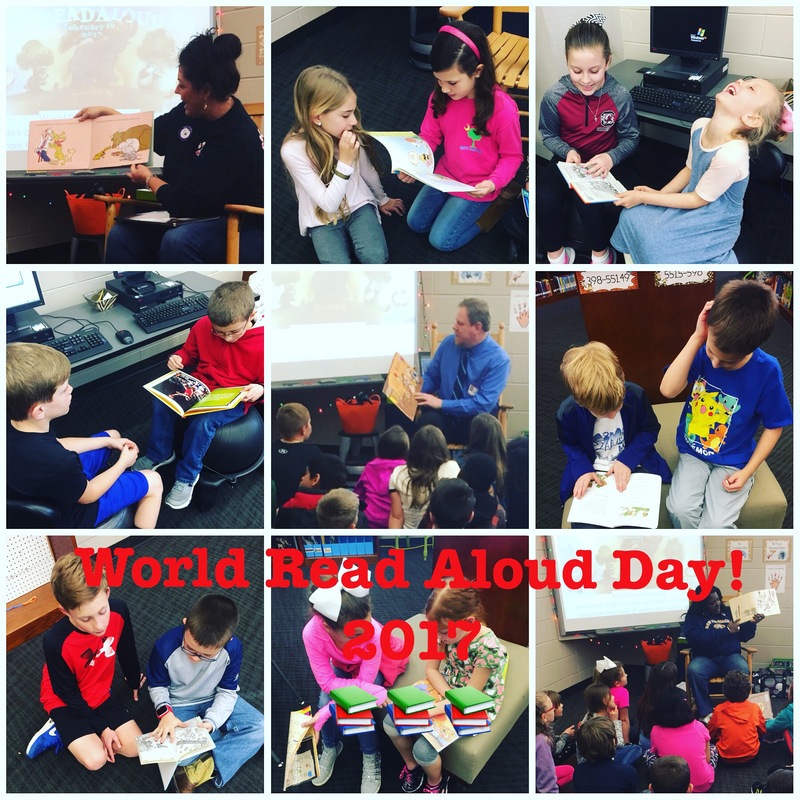 How did YOU celebrate World Read Aloud Day?